There's nothing like having the time for a good, sit down breakfast. If I know I'm actually going to have some time to relax and savor my coffee, I like to try and put some effort into whatever I make. When I got up, there were four plums sitting on my counter just asking to be used. I wanted to make some kind of fruit or coffee cake with them, but also had a little bit of a craving for buttermilk biscuits. I settled on making a cake-like batter based on the biscuits so I could satisfy both urges. Set this out with some carrot juice and coffee and breakfast is served. 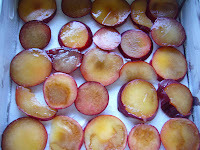 Slice plums into 1/8 inch think rings. Use 2 T of butter to grease a 9 inch square dish and sprinkle 1 T sugar over butter. 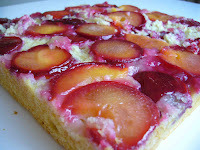 Arrange plum slices in the bottom of the dish as shown and sprinkle additional 1 T sugar over plums. In a medium bowl sift together flour, sugar, baking powder, baking soda and salt. Cut remaining butter into thin slices and add to dry ingredients. Use a pastry cutter to blend butter into dry ingredients until only small crumbs remain. Add buttermilk and mix lightly until just combined. Drop batter over fruit to cover and place in oven for 22 - 24 minutes. When the cake is golden, remove from the oven and let cool slightly before unmolding onto a serving plate. Slice and enjoy! This looks so beautiful and delicious, and I can only imagine how great your morning coffee tasted with this breakfast treat! 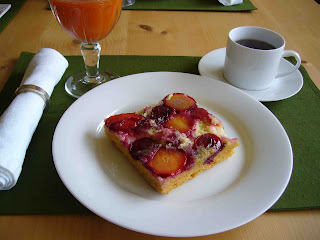 Check out September's "Fine Cooking" it has a whole section of plum recipes- your cake looks as good as the stuff in there. I think this is a great idea. I love taking a recipe for something and turning it into another shape or form (biscuit to cake). I can't wait to try out your recipe!